I am so pleasantly revived by spending the night in Pasadena and choosing to go on a run through their residential streets. To celebrate the finality of my Intro to Commercial Class and the Improv, I stayed in town after the near midnight LIVE casting session. All the hotels and motels were booked with business and tourists in Studio City. So I expedia-ed hotels and the Langham Huntington Hotel sprung up with a summer special and an invite to spend the day at their spa and gym. Could I pass that up? Absolutely…not! www.pasadena.langhamhotels.com Being that Pride and Prejudice is one of my all time favorite movies, I was taken back…literally to a time of estates and gardens and classical music. It was so, so soothing. I was glad for the choice. I slapped on my shoes and realized I had packed no socks. Oh well, don’t particularly like that gritty feeling in overused shoes with no socks, but I quickly forgot the discomfort as the houses passed by. Big houses with tremendous lawns. Huge established trees with winding driveways. Into the miles, my ears tickled to a sound that made me smile. It was approaching and I knew I would be rounding the bend upon a camera crew and a shoot in progress. Sure enough, clank clank. “Tint the glare, strap the wires.” It was a big shoot. 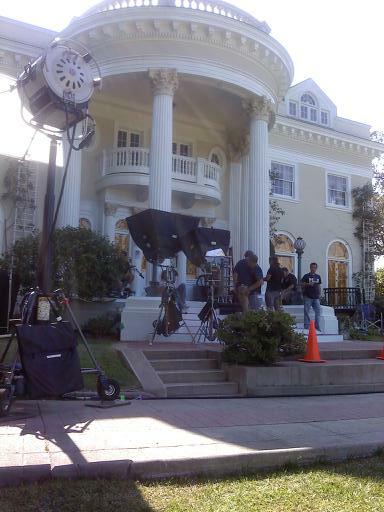 A sprawling white very stately house on a grass landscaped knoll was encased in set equipment . A busy crew was darting about. I didn’t intend to interrupt, but a crew member bellowed, “Hey, jogger. Could you use some cold water?” It was a 90 degree day. The busy people all collapsed in states of instant rest. A break had been called. So I trotted over and got to watch a crew from Warner Bros. work scenes for a new T.V. series to begin next month on TnT involving two long names and a cop and a doctor. They were equally interested in my pursuit to run a remote marathon on every continent. ( Hey, blog. I leave for Australia in four short weeks! Pinch). I went back to the Spa and took hours (an unheard of luxury for me) to jacuzzi, shower, blow dry hair, pick something to wear. I just couldn’t be in a hurry one day more. It was glorious. Soft music and candles. A good day. A day I made good. I was told that there are only 4 Himalayan Tibetan restaurants in all of the USA and one of those was in Pasadena. Made sense to look it up. It is called the Tibet Nepal House and is on 36 E. Holly Street, Pasadena, Ca. 91103. 626 585 9955 Open Tues-Fri 1:3-10pm. Sat. 5pm to 10:30. www.tibetnepalhouse.com . A little hard to spot as the street entrance is small, but look for the shingle. Right next door was an equally intriguing Thai restaurant called the Cafe Linda’s. www.cafelindas.com . It too had a small opening, but you stepped into a cleanly and sleek decorated restaurant . I liked their use of space, the enclosed kitchen, and the quaintly lined tables. I was torn at which to eat at so I did what my indecisive self does best. Picked both. I ordered the Thai food to go and stepped right onto a different continent by entering the Tibet Nepal House. It smelled so yum. My running craved body knew it would like what ever they served. And I did. A handsome man with a sincere smile boxed up a dish with dry rice and a varieties of sauces that ranged from tasting like homemade split pea soup to a fruit, cream sauce. Something in the demeanor of the Tibetans made me feel like coming to experience a taste of this land was a great choice. I asked the man with the smile that filled his face what his name was. He said, “karma”. Oh. I asked what the other waiter’s name was. He smiled broader. If that was at all possible and said, “karma’. I still don’t get it, but even the dishwasher’s was named , Karma. I asked how to say thank you in Tibetan. Dhanyabad…pronounced Dang ya bad. Karma. Well one of the Karma’s at least was from Chyamtang, Nepal. Many of them had been Sherpas at Everest. How very, very interesting. I am definitely going to find myself back there to learn more about a culture, place, and people who I hope to visit on my remote pursuits of marathons. How yahoo is that! We were zinging around setting up transition areas and finish line mats for the Tinman Triathlon and 5K at Cal State San Bernardino when this groups of kids bopped over and started laying out towels, lounge chairs, and running shoes. They had brilliant green singlets on and they were cute, cute, cute. A group of enthusiastic young kids ranging from 5 to 12 that were ‘happy’ to be at this race. They hung a banner on their easy up, “Happy feet”. I liked them instantly. And I liked their leader instantly. 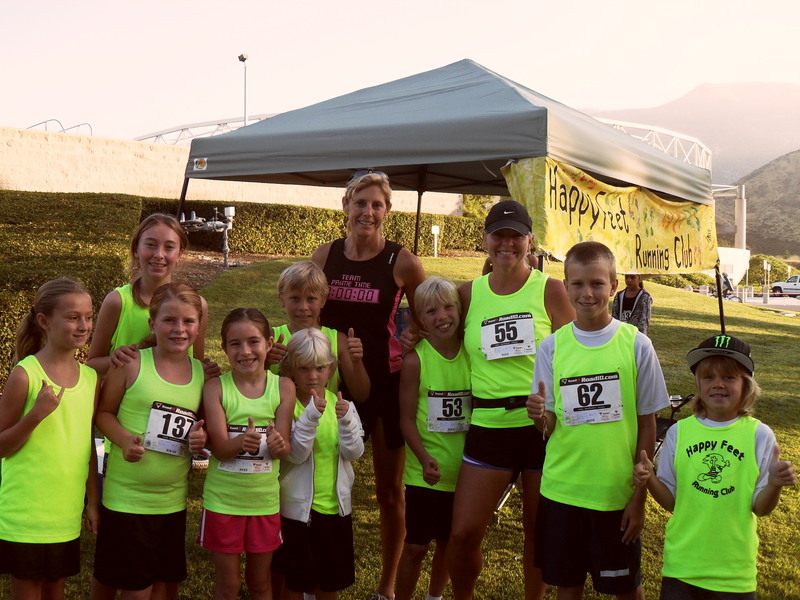 She was an involved mom that wanted these kids to get a chance to be thrilled about running. It was visibly working. What a fun 'feat' for little feet! It was nice meeting you at the race yesterday. 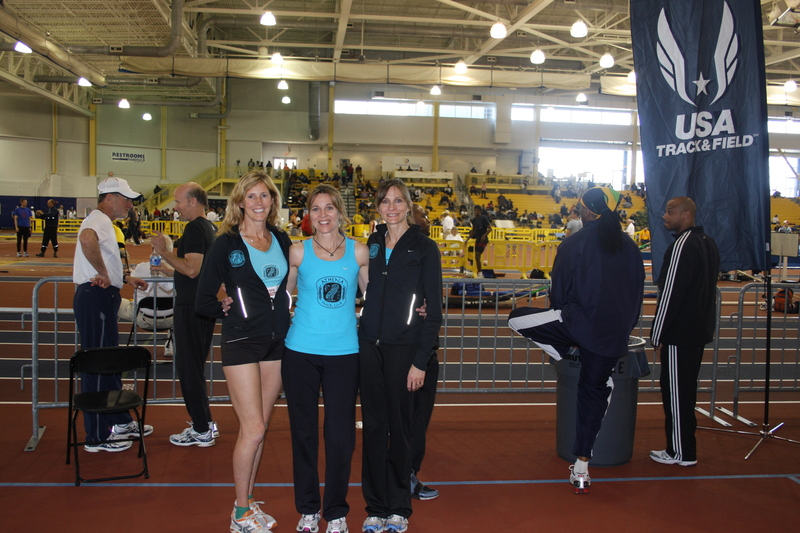 I am the Happy Feet Running Club coach, Michele Epps. The one with all the “bright” Happy Faced kids out there running the 5k yesterday. I am ever-so-proud of all these kids. As I told you, I only started the group this January. I truly am a novice to the sport, having only run for 4 years now. I’ve done many 1/2 and full marathons myself, but nothing as rewarding as seeing these kids cross the finish line. Yesterday I had 10 of my Happy Feet kids there, 7 of them took 1st – 3rd place in their age divisions. They all had a wonderful time at the race and most importantly they had FUN running. My motto with the kids is You Never Fail Until You Stop Trying! My fourth grade teacher, 35 years ago told me I’d never amount to anything! My mother told me differently! I graduated college with honors, danced in a Superbowl, was a broker at Merrill Lynch, started running marathons at 39, now I am a proud mother of 3 and a coach to many! I’d have to say my MOM wins! I try to instill this same drive into the children on my team. I tell them they don’t have to be “the” best…But, they have to be “their” best! That’s all I ask for. Thank you again for taking the time to introduce yourself, It was an honor to meet you! Way to go Michelle! I had to put in 18 miles today. My feet were not happy before I even took a step. It was grueling. It was long. I did laps around Lake Gregory. The faithful Ipod and I. On the last long run I did at Lake Gregory I had taken in the sounds…the birds, the wind in the trees, the sound of canoes paddling. Not this time. I wasn’t that courageous. I was tired in more ways than one. I didn’t particularly want to do these miles. Knowing that they would grind I used the Ipod to pump life and feeling into the miles. It did a little of both. On random, some songs came up with a beat that got a rhythmic pace going. But some artists came up and sang the sad songs of my heart in words better than I could. I felt them. And I felt my aloneness as the miles drifted by. Just is how it is for now, Caren. One foot in front of the other. And somehow the running felt better as the miles chalked off. Somehow, I kept up a fluid strong pace. I rounded the last bend to the truck and felt furiously hungry. I was going to go into the grocery store and lament over what to eat when I got a txt invite to replenish by having a salad at a friend’s. They knew I had been running all those miles and thoughtfully put together the biggest pile of protein replacement a salad could hold…avocados, boiled eggs, turkey, etc.. It was so appreciatedly devoured. And so was the thoughtful act of friendship. I hope to remember to look out for others and do acts of friendship. A thought out act that would put “happy feet” in a day. Do you have days like this? I ran in the heat of the day on purpose. Very sweaty. I tried to take a shower at a gym that was closed for repairs. I picked up a delivery we needed and got behind an accident on the freeway. I was late to an important meeting and had to call a staff to get there and cover for me. I was now sticky sweaty. My office sent out an email blast posting that Eva Longoria Parker could be sited at an upcoming race. Unbeknownst to us, Eva Longoria hosted the 2009 event. Not this year’s event. The media picked up on the search engines that she might be there and I was getting calls from the event organizers about the misleading blast. My phone guts had broken off inside and the phone was slowly beeping a dead battery warning with no way to charge it. I had a full business day with lots of calls and lots of meetings. I was in my tank of a truck. The topper for this day was a premeditated detour to an LA Fitness at Universal Studios . My intent was to take a shower and get a “look” going other than the one I had . The run in the heat at noon and now look and smell like it ” look” wasn’t going to cut it. The day would end with a class evaluation from a casting director as we did commercial reads into a camera. So I tried to park around the back at the LA Fitness. A security guard told me that I did not have a designated pass. I begged him that my truck was too big to fit in the parking structure for LA Fitness. He motioned me away. I shot him that finger look with my eyes. (I rarely use it , reserved for these appropiate moments. That was satisfyling) I squeezed in the underground parking structure next to another oversized truck. I was poruing into another space. Oh well. It just wouldn’t fit anyhwere. As I was in the shower, the PA announced, “owner of a white Toyota Truck. It is being towed.” Are you SERIOUS! I was naked. I threw shorts and a jog bra on right over a wet body and took off on the run. I had one last meeting to make and this important class. I couldn’t be left stranded in LA. Good thing I can SPRINT. I caught the driver as he bounced down Ventura Blvd toward the 101 on ramp. I pounded on his window, and demanded he stop. He waggled his head no. I jumped on the passenger side running board of his rig and gave him the look, “you will just have to take me onto the freeway with you then” look. His eyes widened incredulously. He exasperatedly slammed on his brakes, flung his door open, and raced around the truck at me. He couldn’t even get the words out…’you f..ing crazy lady.’ So he backed up and as slow as molasses disconnected the two rigs. He kept the wheel locks on while he wrote me up a grand towing bill. Finally, he ever so slowly unhitched the locks when the credit card payment went through. Are you SERIOUS? I happened to catch the security guard watching on the corner of the lot. It obviously was his motive to cause that much hassle to my already hassled day. That is worth reporting to…the air, the wind, I guess..you, my blog. I didn’t have any more time to waste about him. I had a meeting to get to. I threw my wet hair back in a scrunchie and made for the meeting. I did my commercial take in my workout outfit and pony tail and …thankfully, the cold read I was handed was about Mortin IB and aches and body pain from working out. Whew. Now tell me, do you have days like today? My body truly aches! 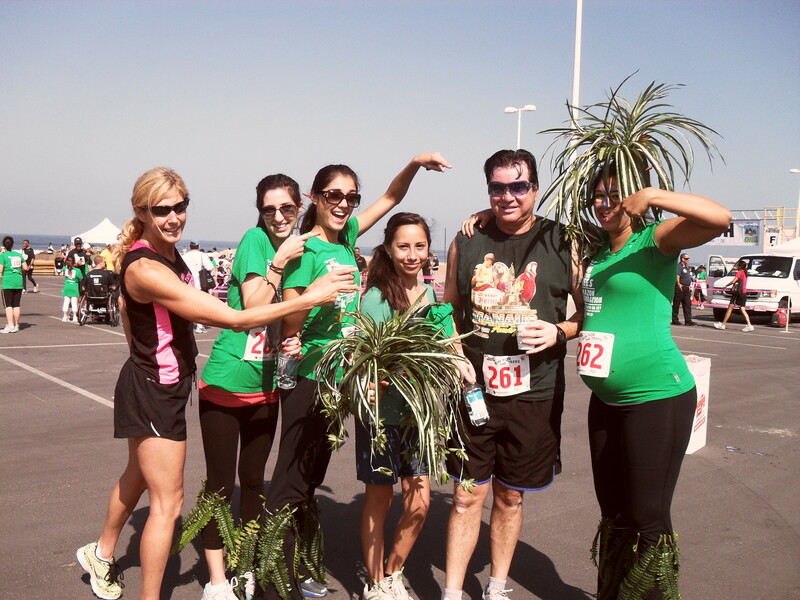 So I had to ask this group if they were really INTO helping save the forest at the Amazon Run for the Trees. Look how they came dressed! They unisoned back, “No. We are just really INTO our DAD. He’s into saving the forest. ” Kind of cool. Happy Father’s Day. These gals were all his daughters. Thanks daughters for taking today to outwardly parade your support for the DAD in your lives. Too special. Too cute. After the race was packed up, it was time for me to put in some serious mileage. I needed to do a consistent 15 to 16 miles. But where? There were almost too many choices…and I was internally in a ‘clobbered by last week’s agenda, the schedule, the emotions, and the car crashes…” mood. I was at Dockweiler Beach. I could run the bike paths along the crashing surf through Manhattan Beach and do a turn around in Hermosa. It was a beautiful day at the beach. But I had done that last week from Hermosa Beach to here and I felt nay inside about doing it again. And today I was alone. I could go the other direction and end up in Venice. Did that on my longest run to train for LA. No desire. Ugh. What if I started in Manhattan Beach? I actually steered my timing van in that direction and then light bulbed about Santa Monica to Pacific Palisades through Will Rogers park. U-turn. 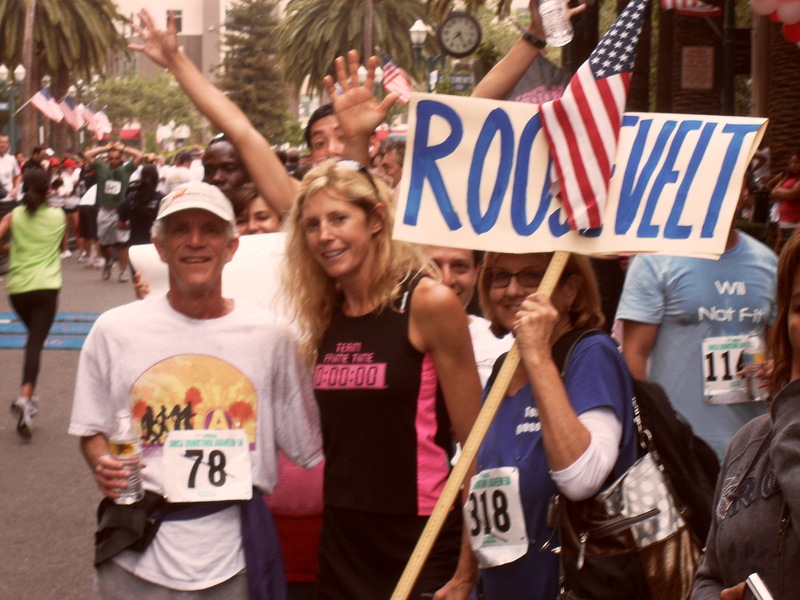 Our featured runner in our newsletter raved about this course she came up with in Santa Monica. But as I headed in that direction I realized I would have no idea of the exact mileage or a clue as to the route. Nay. I just wasn’t up for wandering aimlessly around for miles and chance getting lost and tacking on more mileage. I headed over the 405 toward the valley. At least this was on the route to the mountains as I wanted to avoid downtown Los Angeles. The temps were pumped up in the valley, but I took a left anyway and headed to Reseda Blvd. I was told that you could run the Santa Monica mountains for miles. I got all the way to a sign and a trailhead and was again, overwhelmed by I wouldn’t know where I was or how far I had gone. And it was blistering hot. I didn’t have enough water. After wasting well over an hour trying to drive to a spot to start a run I caved and headed to Laurel Canyon. At least I had some miles mapped out there and I felt comfortable with the crowd using the trails. Dang. So indecisive when you don’t have enough information or experience to know where to go. That’s the great gift of learning from other people and the greater gift of having the courage to try new things until you have a large pool of options. I am aiming for this. So know that I am listening to all your input on potential routes. I really do want to try some of your favorite runs so I have a larger repertoire of them. I didn’t want to tackle the intense hill off the bat so I jogged down to a farmer’s market and bought nuts and jogged back with the bag. That is actually more fatiguing than it seems. I ditched the nuts and Ipoded the hills and I couldn’t do them. I walked a few portions of them wondering what is up with that. I have been running hills for months and just lately not wanting to work that hard…somehow. The crux came when the random songs hit CHANCES. You can page back to my blog on CHANCES and know why that toppled my spirit. I had been enthralled by that intricate person. And now life was a new equation. I finally gave up. I couldn’t run. Not today. I jogged back and my spirit began to break down. About it all. The things I could not control. The pace I was trying to keep. The new enlightened things I was learning. The beautiful home in the mountains that was no longer home. All the deads in life for me right now. I was so ungrounded. I sobbed like no other when I got to the van. Just because that was the real and honest thing to do. I dropped by the photographers to go over the photo shots. I sat back and watched the frames go by and I was stunned by the choice of lighting, hats, and angles, and how naturally and nicely I came across. This was a big step beyond the “the photographer wanted to shoot me” blog. I had learned something. I may not have a ’10” personality that loudly jumps out at you, but I have an essence of shy that actually captures well on film…and if there is a ’10” in me, its what running has done to my body. That was a better note to end the day on. Running helps you Fit in The Perfect FIT. So a quick cappuccino in the lobby of the ’boutique” motel and off to the running stores to deliver bibs and chips. My daughter opted to shop on 3rd Street in Santa Monica and I was honestly contented to spend the day at Top to Top in Santa Monica. (www.toptotop.com) I esteem that store as one of my favorites. Someone ribbed, “only you, Caren, would consider a running store your favorite place to shop. ” But there is something so right for me there. The owner has a great feel for women’s clothing and the fit is right for my lank and hip height. He carries HardTail and I love the subtle colors and cuts of their clothing. So much so, I called and asked if the owner and his manager would search for a women’s sweat pant and top that we would enjoy wearing on my National ‘Fabulously fit females” track and field team. We were a hit. The jackets had that ‘just a little’ extra cut to them and flair on the collar. And they fit us fine. Thank you. So I have to admit. It was a fun female day popping in and out of the dressing room trying on all kinds of mix and match ideas . I bought three outfits, two scarfs, and a perfectly fitting pair of racing flats. Score. I probably will not shop again until I come back to the store next season. And thank you Top to Top for offering a discount to the runners that participated in the Amazon Run for the Trees. 20 percent off! My daughter and I dined on Thai food to avoid the Friday night rush hour traffic. Guess we didn’t dine long enough. I pulled onto Santa Monica Blvd with seemly everyone else in Los Angeles. As we passed the Top to Top store I swung my eyes over to say my respects for a fine shopping day. Split second salute, but in that time some gals had stepped out into the traffic on a cross walk between the lights. Red lights blazed everywhere. I slammed on my brakes, but my tank of a truck was not easily stopped. STOP.,Stop, Stop, I begged. Futile. BAM. I firmly put the bumper into the trunk of the lady’s car in front of me. SERIOUSLY. How could that have happened? That’s two in two days. Does this happen to anyone else? Or is it just me… I JUST CRASHED THE TRUCK into a car. SERIOUSLY. . Sorry Julie, who ever you are with the beautiful Eastern European accent. This time my insurance would have to hear about it. Opps. It was a perfect fit. The bumper in her trunk. struggling with the miles, walking a lot of hills lately, and for some stressed reason, crashing into a lot of poles and cars! My daughter reminded me she had an acting class to audit in NO HO (North Hollywood). A trip back to LA from Lake Arrowhead!!! Ugh. But I relish the time with her and wasn’t about to let a seventeen year old drive herself to North Hollywood. Scramble. Pack. Load the vehicles for packet pick ups. We had two events for the weekend. Each had the opportunity to pick up bibs in running stores. The Culver City 5k/10K was organized by Sporteve, a women’s triathlon, running apparel store on 3849 Main Street, Culver City, Ca. 90232. www.sporteve.com. And the Amazon Foundation Running for the Trees was to have their bibs at TOP to TOP at 2621 Wilshire Blvd, Santa Monica, Ca. 90403. www.toptotop.com. Both are great running stores. I love to accessorize in Top to Top so I plunged at the chance to work the packet pick up. It would give me a day to try everything on in the store. Fun! So it didn’t make sense to come back to the mountains because we had to be at these stores early Friday morning. Another LA hotel stay. Blah. But nice to have the company of my daughter. So, where do the PERFECT 10s come in? The acting class was held in a studio off of Lankershim. I couldn’t find it until a call explained that the stairs in the back alley let up to the studio. Oh, there’s the sign up there. I see it now. It was behind a huge red building, the PITFIRE Artisan PIZZA building on 5211 Lankershim Blv, North Hollywood, Ca. .I had a lap top and four hours to kill. It was the culmination of the basketball championships and the Lakers were one game away from being champs. All the establishments in North Hollywood were buzzing. I decided to shyly hang at this Pitfire Pizza place. It had that funk thing I like. The ovens are fueled with real wood. The large front patio has a fire fitted bar to sit around and chat an evening away. Kind of cool looking. And the big screen T.V. had everyone sandwiched in and fixated on the game. An assortment of people there to cheer. Of them, there were these two gals. Beautiful black skinned, hair styling, nicely manicured gals. But it wasn’t their outside that was a magnet attraction. It was their essence from the inside out. They were thoroughly operating at a ’10’. They were having a ball and it was contagious. Not outrageous. Contagious. They were perfectly comfortable within themselves and they were loving the opportunity and excuse to share their zeal. It was poetry to watch. And I got it. “Take it to a 10, gals”. They adeptly pulled people in on their stage and conversationally grabbed me from my corner and made me, and everyone else in that room, a welcomed part of their play. And it wasn’t an act. It became a pleasure to be there. Yes, gals…PERFECT 10 performance in my book. Worth applauding. I get it. The Laker’s WON. And that was the pinnacle. These girls turned inside out and we all did with them. Yahoo. Yahoo. They screamed…giggled…and then just sighed. They looked around the room and burst, “Wasn’t that the funnest!”. I felt the gift of their willingness to operate at a 10. My daughter and I drove through the deserted 405 near midnight. I had booked a room on Expedia, at the LA Sky Hotel on Westwood Blvd between Olympic and Pico. www.skyhotella.com . I expected it to be in a high rise with a name like that. So I was following the voice of the navigator in my huge Toyota Tundra truck and shell when… BANG. What the heck was that? THAT was someone’s sporty little car. I still don’t know how we kissed, but BAM we did. The gentleman gets out and we ‘exchange’ the necessary info. He hands us his card. My daughter looks at it and without quam asks, ” I see you are a lawyer. Wouldn’t happen to be a divorce lawyer? My mom could use a good one.” Sorry Mark, whoever you are for the hassle of having to fix scraps on our vehicles. We hope to repair them without using the insurance. I had almost no outward reaction to the banged cars. I couldn’t even find the rise of a 1 or 2 emotionally. I was spent. So we FINALLY arrive at this SKY hotel, that is really a dinky motel sandwiched between businesses and near impossible to find. I was slumped. But then, was very pleasantly picked up when we walked into the place and it was so invitingly sleek and chic. The attendant was so helpful. Their lobby was one of the best espresso bar set ups I have ever seen and the room was very upscale and tastefully modern. I guess these are called “boutique” motels. Quaint. Slick. I liked it. “Take it to a 10!” Cash, a brick house man of a man with a Southern drawl jumps up and down in a kid voiced tantrum. It was hilarious. “Take it to a 10!” Taylor, with his dimpled chin and curly hair to die for pretends to zen. Cross-legged yoga style, he hums, soaking in the universe’s powers when one eye pops open and he appeals to the audience, “ARE YOU FEELING IT WITH ME!”. We laugh. But when my turn, I talk right over my partner, don’t connect to what he is saying, and get a deserved half hour talking to by the instructor. When asked how that made me feel, to hear all the things I needed to work on, my chin set to moving despite my rebukes and the tears couldn’t be squelched. Believe me. I tried to will them back. I could feel how I just couldn’t give up the self-protection. Also, I couldn’t hide my take charge obstinacy I have survived on. By being the authority, I keep my vow to never give in to anything that wishes to oppress me. These lacks he was addressing were so in my core .The reasons I had built up issues made me frustratingly angry. I didn’t know how to place that angry so it rushed into hurt. Hurts to cry at my age in front of a group of people I have learned to love and trust, but STILL can’t connect with. If only I could blurt out what the last weeks and months had been like for me. The attacks and damage of dealing with divorce. The infliction. The axe swings at my esteem. All the ‘ex’s attempts to exasperate or douse my search to discover, recover, and explore. Down to verbally bashing and wanting to roadblock my goal to run a marathon remotely on every continent. Sorry class. There was self-protection in me . Self preservation in me. I was under seige. I was at war, even war with myself. This is hard to put aside. It will with time and courage. Oddly,this battle with divorce ,was un-bandaiding old childhood wounds that just added to the pile of pain. Ugh. Take it to a 10? This was the level 10 in my life right now. Hi. New to my blog? Click on April and read backwards to this date! I am attempting to run a marathon on every continent. Run through life with me. Got a chance to do a photo shoot among the carpet of blooming poppies out in the high desert near Lancaster. It was a true celebration of being fit and hugging and loving the outdoors. It was the BEST place for me to get to RUN wild. The wind was whipping fiercely and the temperatures were far from spring like. Snow dusted the foothills. But what a backdrop for photos…clouds, sky, flower arrayed hills. Kind of fun to do at my age. Running lets me. I enjoyed today. Even got to do a hill run with sprint repeats this afternoon. Now im in LA hovering. I have a day stacked with meetings tomorrow and it is too far of a drive all the way back to Lake Arrowhead. Sitting in a Days Inn. That’s not so yahoo. Going to go treat myself to yogurt. Bye. Good night blog. Race days. PRIME TIME intros Instant results instantly! We timed some really well staged events this past weekend. For the runners, The Anaheim Downtown 5k was a fast and any ability friendly course with the friendliest and festive set ups. The enegery behind this event is an avid runner ,Larry Herschler. Larry Herschler not only RUNs the race..he runs in his own race! put this fun event on. 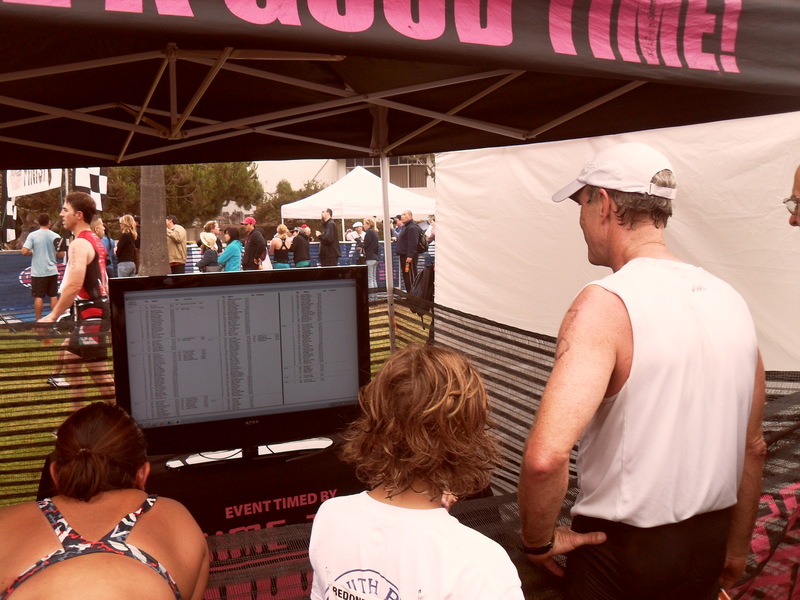 And we timed the Redondo Beach Triathlon. It is triathlon haven. 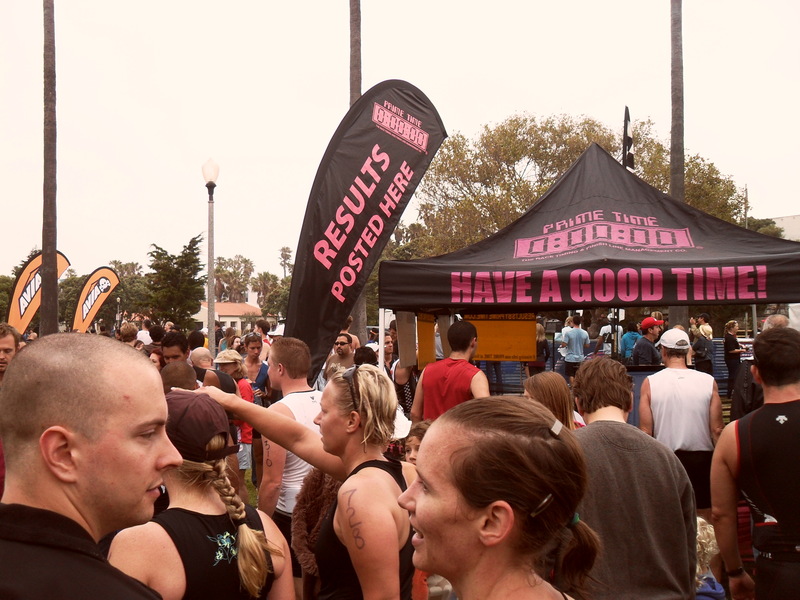 The Expo was held at Tri Labs 600 N. Catalina Blvd, Redondo Beach, Ca. 90277 (310) 374-9100. 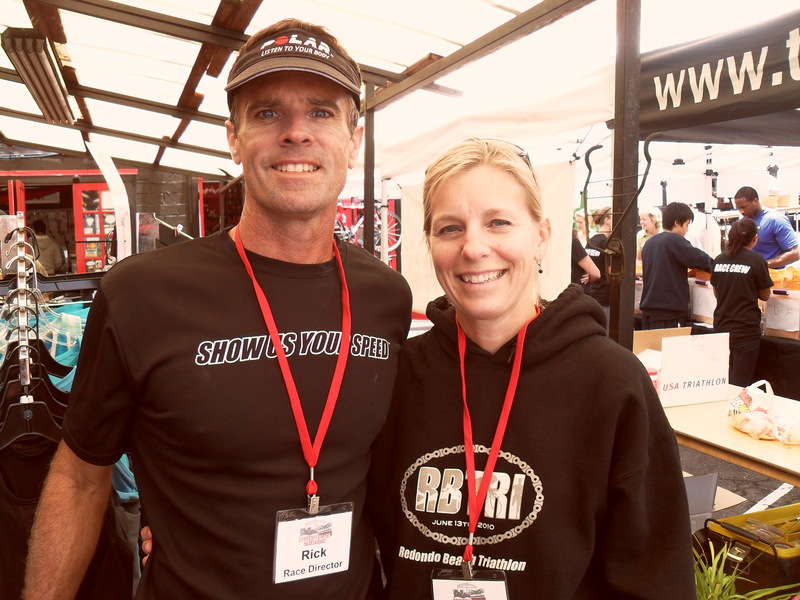 If you are contemplating getting into triathlons all you have to do is visit this store. They have the start up packages: bike, helmet, goggles, swim suit, etc.. and they have exceptional bikes and pro pro everything. It is the all and all triathlon place! www.triathlonlob.com. Redondo Beach is a superb place for a triathlon. The surf is rarely wild and the bluff allows the spectators to have an impactful perch to watch the entire swim. That perch presents a hill challenge for the swimmers who have to run from the beach up the bluff, but I think the triathletes will agree that it makes it an ‘event’ that they had to put some push into it, and all the more worth doing. Rick Krump and his beautiful wife Connie stage the event. We were too busy doing a great job transitioning all the participants from swim to bike to run to finish that we hardly had time to greet one another. I am going to contact the Krumps and tell you more about them. What I do know is that they are raising triplets! That is unusual. And that they are very active and have the energy and life zeal to pull off a great triathlon. I have great staff that love exploring new ways to bring stats and results to you, the participants. 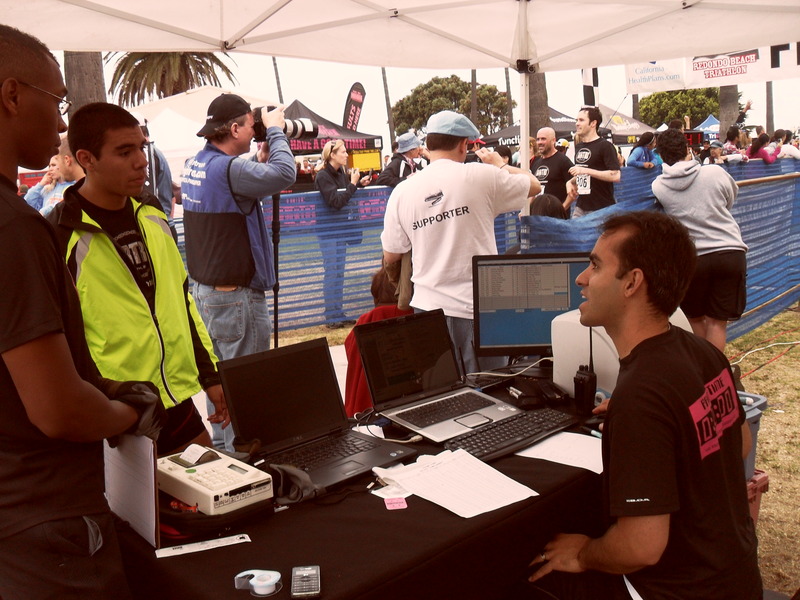 Brandon Walters is running a wireless system during the Redondo Tri that allows the announcer to let the crowd know who is where, when on the course. It is very cool. Yeah, PRIME TIME staff. Yeah, Brandon for loving electronics! I EAT therefore I RUN! I don’t like to take the time to cook, but I LOVE to eat and like finding fun, funky atmospheres and places to eat. I don’t know about you, but RUNNING inspires my appetite. Let me introduce you to the places in ‘my neck of the woods’ (San Bernardino Mountains) that I feed myself at . They are not fancy, but they have the atmosphere. They have funk. And they have people behind them. I like the owners. I have frequented them so much that they know me. And I am very interested in their success as I am also a business owner. So I have three fav places on the mountain. The Robeks Juice place in Lake Arrowhead Village (lower level by the A) is owned by Rosanne. Yeah, for some healthy fluids to tank bodies. I get a LOT of quizzical looks when my order is always the 800 Lb Gorilla. I think I am the only one that orders it. Sorry folks, but it has over 50 grams of protein and my body says yum I need that. Rosanne is fun, hard-working, and always interested in what her customers are doing in their lives. 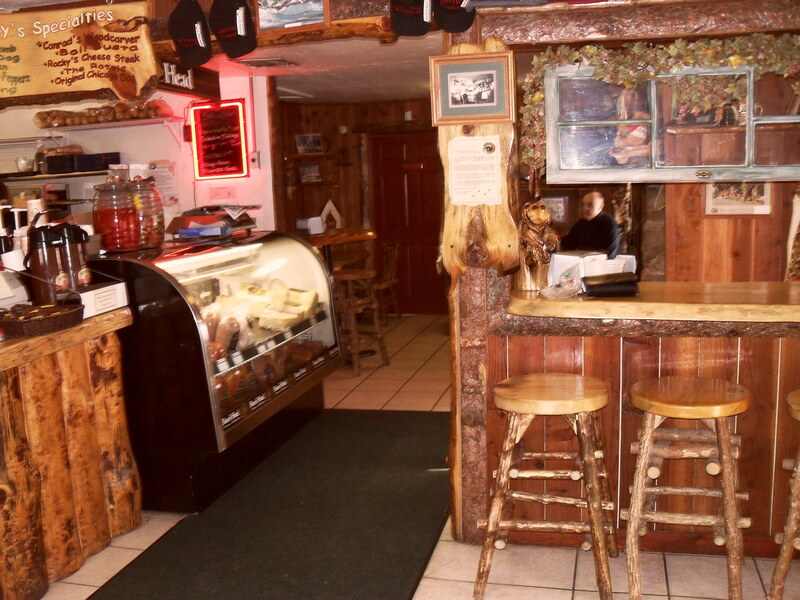 ROCKY’s Sandwich Shop in Sky Forest has THE BEST meat on the mountain. It specializes in juicy, drippy, oozy hot meat sandwiches with the BEST coleslaw. 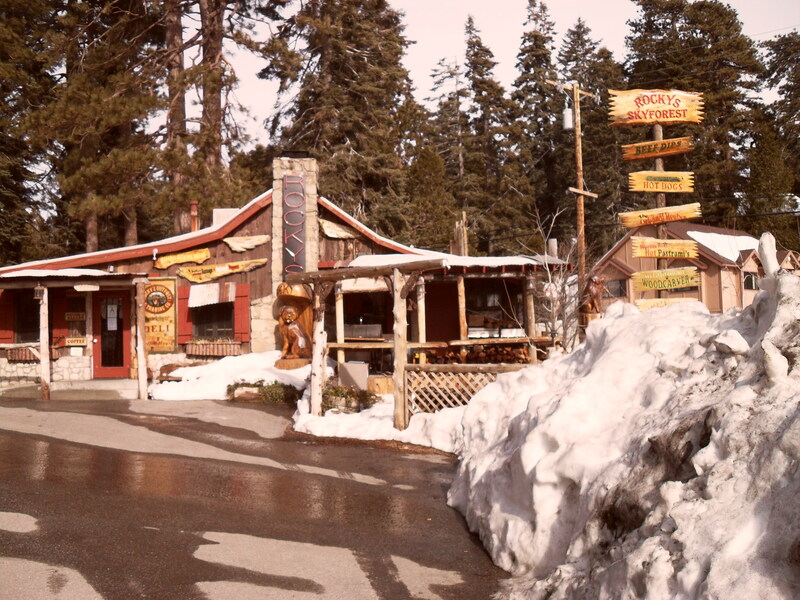 It is located on Hwy 18 as you leave Arrowhead and head towards Running Springs. It is an excuse for me to drive the RIM which sports views of the entire So Cal basin. On clear days you can see Catalina Island and the high rises in LA. The owner LOVES wrotweirs (no idea who to spell that) dogs and named the place after his most beloved champion. He did the decor very mountain style with heavy pine tables and stools, and outdoor picnic benches and it is just fun. 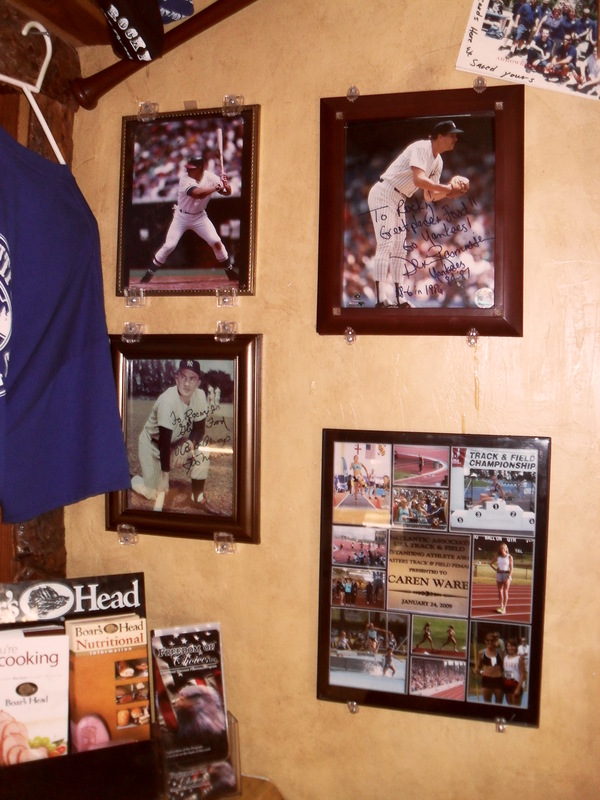 Fun too, is they have a plaque posted on the wall about my running sandwiched between baseball players that also frequent the place. And The Lake Gregory Coffee Company at 23776 Lake Dr., Crestline, Ca. 92325 (909) 338-8211. The owner, Steve is by far the hardest working man I have observed on the mountain. He is up at 4am baking muffins, he has to die for sandwiches (I have a preference for sandwiches. You get your meats, your veggies, great bread, and the excuse to eat side dishes that feel like you are on a grand picnic. This place jams on potato salad and pasta salads. And they have the drinks. You name it, they will whip it up for you. To add atmosphere to the converted gas station gone coffee, Steve has added a touch of the islands and beach to our far removed from the beach mountain. He built a bar hut that makes me feel instantly back in Tahiti. It is very inviting to sit outside, use the WiFi, and pick any kind of drink. 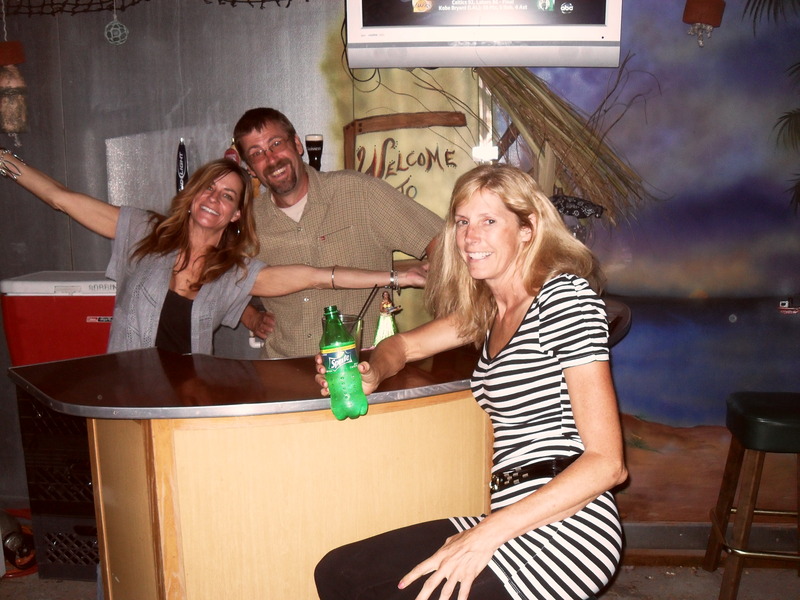 The atmosphere is set by the coffee shops experienced bartender, Allyson. It is a greet and meet place and I like it. So I have parked my truck there many times, announced the mileage I have to do, thereby making an audible commitment to having to finish that mileage and run around a great running track put in my the county that goes all the way around the Lake. These are the three-mile laps I can mix and match because there are trail options too. So that’s what I do on my mountain. Run to EAT. Steve, the owner is the real McCoy Muffin Man. Allyson is the real deal bartender. Crack up to have the cruise beach motiff on the mountain. FUN!